In the picture: a group of volunteers gather plastic items to be recycled using trash bags in a wooded area. Okay, so ETI’s participants with visual impairment learn new skills, gain confidence, and feel hope for the first time during the month they participate in the Life Skill Program and Camp Rafiqi. Where do they go next? ETI has designed a community service-based program model that allows for its participants to demonstrate their value to society. The Social Project Program exists to do just that. A three-to-six-month program that builds on the philosophy created in the Life Skills Program and at Camp Rafiqi, both blind and sighted youth carry out community service projects through collaborations with local organizations. This is monumental because, for many children with visual impairment, their participation serves as their first time going out in society without being helped by family members or guardians. This experience also serves as their first time on the giving instead of the receiving end. Witnessing these children performing acts of community service allows fellow citizens to realize that they are like anyone else, and are not a charity to be pitied and patronized. This helps to break the stigma of disability for both groups. Cerine, a past participant in our Social Project Program, informed us that she never thought she’d be able to help other people herself. Other people would often help her, even though she was fully capable of living independently. Completing a simple recycling project with kids her own age made her realize that she had the power to do anything she wanted. Past Social Project Program facilitators have reported that the involvement has changed not only the youth with visual impairment, but also the sighted participants. They have noted that the sighted participants began to accept the visually impaired kids as part of the group, learning to regularly ask for their opinions and to engage in conversation with them about their personal lives. This may seem like a regular occurrence among peers, but it is revolutionary and critical for those with and without disability in a setting where the two groups have traditionally been segregated. So, Have the Seeds of Confidence Been Planted? ETI's Founder and CEO Sara Minkara guides Fatima, a student with visual impairment, to her STEM class at Camp Rafiqi 2017. Intellectual stimulation is one of the expected outcomes of Camp Rafiqi’s curriculum because learning and critical thinking allows individuals to expand their minds. Besides learning, though, social engagement and personal accomplishment are also expected outcomes. Being in an environment in which opinions are wanted and creativity is encouraged can, quickly and simply, turn wallflowers into contributors. This is a major piece to the puzzle of inclusion in society—those who have been marginalized must, of course, learn new things every day and grow intellectually, but they must also become empowered to speak their minds and be themselves. 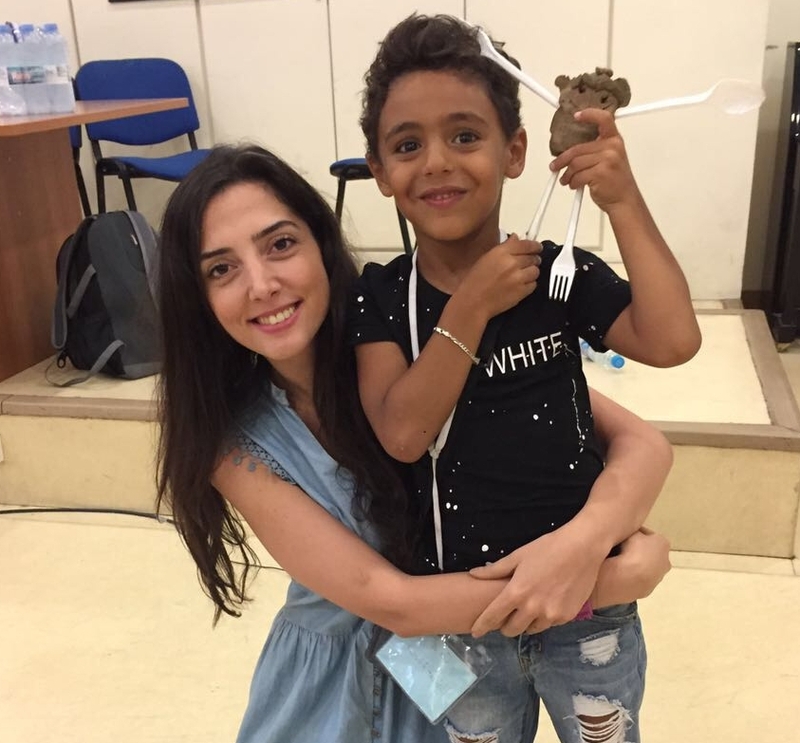 In the picture: Rania, ETI art class trainer (left) poses with a camp participant, who is showing off his sculpture; she wraps her arms around his waist. As noted in previous blog posts, Identity classes have been an important component to Camp Rafiqi’s overall goals. The identity classes seek to cultivate independent thoughts of how we see ourselves within a community through a dialogue between peers, the creative process, literacy, and reflection. This curriculum is essential in empowering those who have been marginalized in that it teaches them to speak for themselves and to address their feelings. 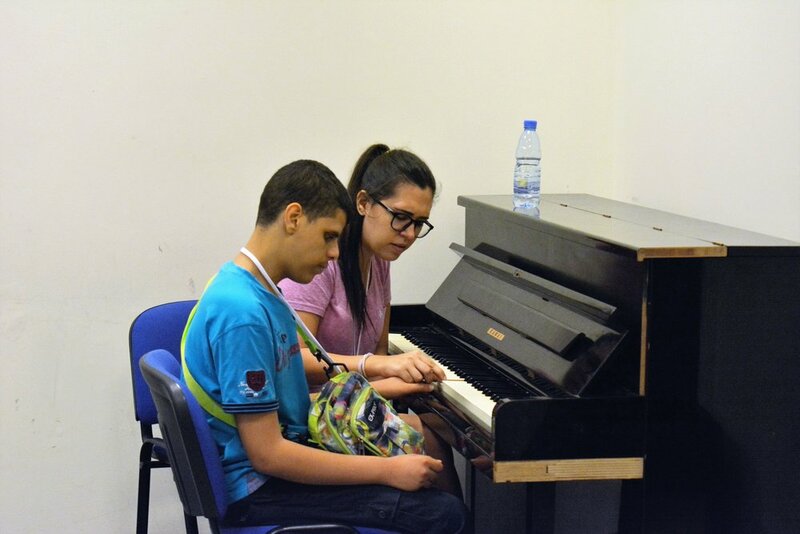 In the picture: a music teacher sits to the left of a participant with visual impairment at a piano and guides his hands on the keys. Participants have also become more comfortable, and have realized their potential, during their STEM, soccer, music, and theater classes. To continue this momentum, we want the children to immerse themselves in work that further demonstrates that they are not a burden to society—and that they can contribute to the improvement of their communities. Being on the receiving end of society is disempowering. As human beings, we are driven to seek out self-fulfillment, independence, and dignity. Being a fully-integrated member of society means contributing to society as well. According to twentieth century psychologist Abraham Maslow’s hierarchy of basic human needs, the need to feel as if one belongs at the top of the list of what every person across the globe needs. This means that humans don’t just need the basics such as food and shelter—they also need self-fulfillment in order to be fully functioning members of society. This includes being on the giving end. Being on the giving end allows individuals to gain confidence, because they have been given power and autonomy—often for the first time in their lives. Just ask Cerine. “I love to do my own chores without my mother’s help,” she reported to us after her involvement with the Social Project Program. This may seem like a small task, but for someone like Cerine, it’s life-changing—and it’s why ETI was created. Older PostWhat is Camp Rafiqi?